It’s the first day of class, Brits. 400 or so first-years are sitting through their first college classes with you right now, loaded with anticipation, fear, excitement and more energy than a dozen upperclassmen. About a thousand older students are plotting how to quickly grab their syllabi and dash out of their classrooms to the loud comforts of frat row. A new president walks the campus grounds. The grounds themselves look quite different–it’s obvious the college has put a great deal of effort in cleaning up for our return. Things we might have never thought would change–where our president lives, the lighting on the Hannah Street main drag–were changed without us even being here. It makes you wonder what might happen now that we are. I’ve always believed that the Pleiad occupies a unique online space. As an Albion College student, I’ve always wanted something to corroborate my experiences here. You see people posting articles on Facebook from sites that cater to specific experiences: an online extension of real-life communities. I’ve always wondered where that place was for Albion. I’ve always wanted a resource that answered the questions I had about the school that I couldn’t find elsewhere. I wanted to hear people’s thoughts on the campus around them and the events that affect it. I wanted to hear people reflect on their college experiences. I think the Pleiad should be that online space. I want the Pleiad to be a student news organization that students can use and enjoy. I want to be able to answer the questions we have about our school that take some unraveling to answer. What do college ranking lists mean? Who’s behind the sexual assault talks given to Albion first-years? What are all these events going on, and why should I care about them? Is there anywhere I can eat that isn’t McDonald’s? I want you to be able to check out the Pleiad and find the answers to those questions. Newspapers exist to inform the public, and for the Pleiad, our public is you, the students of Albion College. Every Monday, Wednesday, and Friday, the Pleiad will have new stories exploring Albion College, from its little-known quirks, to its hidden secrets, to breaking news and opinions on the issues that affect us as students. 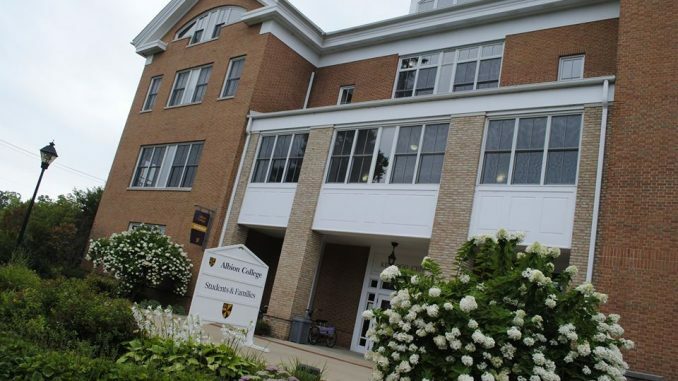 The Pleiad has been a part of Albion students’ lives since 1883. Albion is about as used to the Pleiad as it is to having electrical power. As more and more of our lives move into digital spaces, I see no reason why we should leave out the invaluable social and intellectual value of the Pleiad behind. As online journalism becomes an even bigger part of our lives and the way we learn about the world, so too will the Pleiad. I’m hoping the Pleiad will help you put your Albion College experience online, recorded forever in the ink of the internet. If you want to be a part of this project, please share Pleiad stories on social media. We are on Facebook and Twitter, and are moving to expand our social media presence to provide even more comprehensive news coverage for you. Comment on our stories, and tell us what you think of them. Journalism is discourse as well as reporting. I’m committed to making the Pleiad as responsible and transparent a news organization as is possible. If you think an aspect of campus life should be explored in greater detail, or you have news the student body needs to hear, please reach out to the Pleiad via email at Pleiad@albion.edu. Similarly, the Pleiad strives to correct all errors of fact. Please inform us if we have misrepresented the facts in our stories. So there you have it, Albion College. It’s the first day of class. Look forward to the Pleiad’s upcoming coverage, including a report on the law firm behind the first-year student sexual harassment seminars. For now, enjoy syllabus week, and read Albion College president Mauri Ditzler’s opening remarks for the semester exclusive to the Pleiad here. Another really great article Spencer. I have really enjoyed every article by you that I have read. I like that you talked about creating a space for college community members to share their experiences and find answers to the questions that they can’t find anywhere else. I too want the same things that you listed here. I think we should make the Pleiad’s website the real online gathering place for students, faculty, staff, alumni, and Albion community members to find the answers to these questions and share their experiences. I look forward to the coming year’s fascinating stories from the Pleiad.